A pair of soldered steel earrings with sterling silver ear wires. 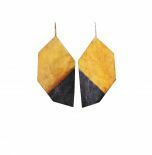 These earrings are based off of a loose line drawing. They have been hand cut, shaped and soldered. They are roughly 2 3/4 inches in height (including the ear wires) and 1 3/4 inches wide.